Oh, Interwebs, how I love thee. How else would I have met Betty Jane Hegerat, author and fellow graduate of the University of British Columbia MFA program with my dear friend Mary? 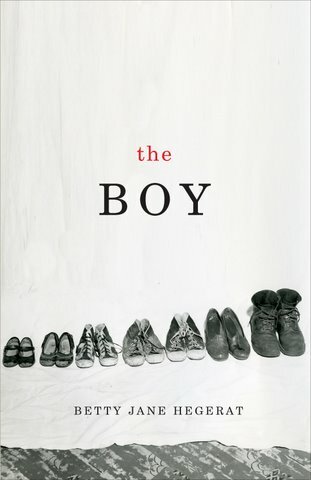 Betty Jane is the author of two novels, a collection of short stories and my favorite book of the season, a creative non-fiction gem, The Boy, published by Oolichan Books. The non-fiction part of the story revolves around a mass murder that took place in Alberta, Canada in 1959. The brutal murder took the lives of Ray and Daisy Cook and their five young children. Robert Raymond Cook, Ray Cook’s son from his first marriage, was convicted of the murders, and became the last man hanged in Alberta. The fiction part of the book manifests in a character named Louise, a story that Betty Jane found herself inexplicably reluctant to write. Where things become even more interesting is how Louise’s story becomes entangled in Betty Jane’s childhood memory of hearing about the gruesome mass murder. The “truest” part of the story is that Betty Jane spent four years obsessively tracking down information and poring over the Cook family case, while also dancing around the fate of the fictional family. While both stories keep coming back to same thing: the boy. As a writer, I sat in awe of her deft ability to move between the fictional and the real, not just the actual events of the Cook case but also her own memory and most compelling, the way that series of events took hold of her and her writing. And she let it. I admire that kind of bravery. It’s my pleasure to welcome Betty Jane Hegerat to the blog. She so graciously and honestly delved into what I believe was the most disturbing part of the book: the relationship of these two boys: one real and one fictional, with the women they called stepmothers. Me: Tell me the role of “motherhood” in The Boy, as it pertains to Louise, Daisy and even your own journey. Betty Jane Hegerat: Hi, Jenny. Thanks so much for inviting me to your blog. It was a real pleasure to hear from Oolichan that a review copy of The Boy had gone south! And what an interesting question you’ve chosen. When I was wrestling with this story—obsessed with it and frightened by it at the same time—Louise, my fictional character, finally poked her finger into the heart of my discomfort by asking if I was afraid this could happen in any family, including my own. Of course. Aren’t we all shaken when a seemingly ordinary family appears to have raised a child capable of turning on them in a murderous rage? When I began this project, my two older children had left the nest, but our sixteen-year-old son was at home and we were a stomping ground for teenaged boys. Robert Cook, at that age, was in prison. Sure, a big difference, because Bobby Cook had been stealing cars since he was twelve. He was an accomplished, although somewhat stupid break-and-enter artist who was always caught. My older son was 23, the age at which Cook was hanged for the murders of his family. Again, big difference between my respectable young citizen and jailbird Cook, and yet dozens of people, including those who knew Cook in prison, claimed that while he was a two-bit criminal, there was no violence evident in him, and in fact he carried pictures of his young siblings with him, and had a close bond with his dad. Unfortunately—and every article and book I read on this crime looked to this circumstance to explain Robert Cook’s potential for violence—Robert Cook lost his mother when he was ten years old. Two years later, enter the stepmother, Daisy. And this was where I’d begun the fiction I was writing when I remembered the Cook story and got so hopelessly tangled in it. I began with Louise, poor hapless woman, meeting Jake, a man with a 12-year-old son. Louise knew from the first things Jake told her about Danny that the boy was going to be a problem. Stepmothers; how many stories are written about wonderful relationships between orphaned children and their stepmothers? How does someone take the place of a mother made perfect in death? Mothers who have birthed their children harbour their own dark fears and guilt that no matter what they do it won’t be enough, and that for whatever deficiencies the child exhibits as an adult they are to blame. But imagine taking on the responsibility of someone else’s child, particularly one who’s already in trouble. I’m a social worker by profession and have worked with foster parents and adoptive parents who can rise to the challenge, and I’ve known some who have the rare gift of being able to love unconditionally. Most of us, though, also have a fierce protective instinct when it comes to our own children, or even children who’ve been entrusted to our care, and if there’s one who’s a threat in any way, how do we deal with the threatening child? It was difficult, fifty years after her death, to find people who’d been close enough to Daisy to know how she felt about her stepson. Most of the evidence suggests that she tried very hard to be the good stepmother. She wrote to Robert when he was in prison, she took him back into her home with her small children whenever he was between “gigs”, and it was reported that she told people he was good with the kids. She tried. I wanted to know how she felt about this boy, whether she was afraid of him, or just afraid for him. What I really wanted to know was what was said on the night of the murders, and whether, as speculated, Ray and Daisy had finally told Robert he was no longer welcome at home. I went looking for Daisy, mother of five young children who she must surely have wanted to protect from this older brother even if it was only a question of reputation. I never did find her, so I used Louise as my means of speculating. Louise is afraid of Danny, and although she may have been inclined to send a tie and a pair of socks and does send other gifts, each time he returns home she pulls the defences tighter around her family. Perhaps if I’d been able to tell Daisy to do the same … but then I’m laying the blame on Daisy, aren’t I? And surely it’s not always the mother who is to blame. Feel free to chime in with your own thoughts. And thanks again to Betty Jane for her time and one of the most poignant reads of the year. Now. Quick, people, get thee to the book shop or start clicking to purchase. This is a fantastic book club/beach book/writers’ group discussion waiting to happen. Enjoy. It’s a great read, indeed!